For the party everyone had to dress in pink. We listened to the singer Pink and ate pink food and drank pink drinks. We played the M&M game with pink and white M&Ms and tried to see how many pink marshmallows we could fit in our mouths. We made some pink jewellery and everyone gave the birthday girl pink presents and cards. We painted our nails different shades of pink - sunkissed pink, bubblegum, pearl pink, bright pink... We also had a pink fashion shoot and pink makeovers. We had a pink birthday cake, pink jelly, pink cupcakes etc., etc. All the decorations were pink as well. Hey, so my fav color is green so I had a green party!! 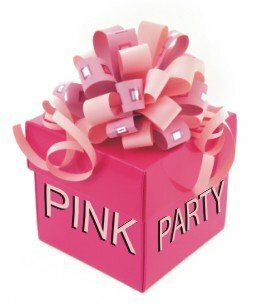 Your pink party sounds like fun but I think you can do any color of the rainbow!!!! LOL! THIS IS TOTALLY PINK!! Lol! After reading this idea I'm totally doing this for my party!! Everything at my Pink Party was pink from the carpet to the drinks. It was a diva runway bash. It was pretty in pink. Maybe I'm gonna try this pink party.....!!!! WOW!!!!!!!!! I luv that idea. I am soooooooooooo doing that for my next b-day party once. I'm not a pink kinda girl but all my friends would be amazed!! !